The Metropolitan Milwaukee Association of Commerce (MMAC) issued its poll results that stand in stark contrast to a Marquette Law School Poll released April 16. The Marquette poll found that 79 percent of registered voters oppose the state borrowing $150 million for the proposed arena project. That would be a bit of a discrepancy, yes, and seems like it could only be a function of the wording of the two polls. We know that the Marquette poll asked residents whether they support or oppose the state “borrowing about $150 million to support a new arena for the Milwaukee Bucks,” among other budget options. But what’s that “full proposal” that was presented by the MMAC poll? As it so happens, respondents were first told that the Bucks would leave Milwaukee without a new arena, then were told that this would cost Wisconsin hundreds of millions of dollars in lost tax revenue, then told that “there would be no new statewide taxes, and revenue generated by the NBA team will more than repay the public investment.” After hearing all that, respondents overwhelmingly thought this was a good idea. Now, some critics might quibble that not all of that is technically “true”: Countless economic impact studies have shown that sales tax revenue isn’t much affected by a sports team leaving town, and that “revenue generated by the NBA team will more than repay” claim is extraordinarily dodgy as well. But, yes, if you tell people in Milwaukee that you have a plan where they’ll get all their arena money back and will lose the team if they don’t approve it, lots of them will say okay. The Milwaukee Business Journal should be ashamed for even publishing such a blatant push poll. I could call up 1500 random Milwaukee residents, ask them if diverting $200 million from education, roads, parks, and other essential city services and give it to a few billionaires to fund an arena that only they will profit from, and probably get a response rate of at least 85% opposed. Like the terrible deal in Sacramento, Milwaukee is about to get screwed sideways and it seems like nothing will be able to stop it. This is probably just an arcane point but there is an added effect of the “wording” of the questions. As noted by Neil there is the obvious impact of wording a question to make the proposition sound better than any honest discussion would allow. There is another known bias, “Acquiescence Response Bias” that is at play here and I think in a lot of stadium “polling” I have seen. That is, people generally try to be liked and often respond in ways to modestly please the questioner. When a question is framed this way, it is not just that the words make it sound better, but it is clear to the respondent that the question has a slant or an angle that they will more often than not try to acquiesce to. This effect is substantial where there may not be a strongly held opinion already (so, if I say I’m from the Cow Appreciation Society I am more likely to get a positive favorable rating for cows in a survey than if I did not say that). The Aquiescence Bias is probably not as strong as the impact of the wordcraft and the dishonest framing in this example but I think it is impactful as well. Even if the MSM does not report this poll, MMAC got their money’s worth, since they will use it for their lobbying talking points. Politicians may not know one poll from the next. The oligarchy machine in MKE is well-oiled, with Bucks co-owner Ted Kellner appointed by Gov Walker as chair of the Bradley Center arena authority board. He’s also chair of the MMAC board and others. An efficient closed loop. This deal could get done in no time…if they figure out stealth financing as Neil described. A few things. Lets say the state does borrow $200 million for the arena. If you finance that over 25 years at 5% after all the issuing costs rolled in you’re talking annual debt service of a little under $15 million. A good chunk of that you will get back in the form of income taxes from players and staff revenue that clearly would not exist if the team leaves. However, some perspective here: The annual state budget for Wisconsin is over $36 billion. So the debt service payments would be .04% of the state’s annual budget (not including the income taxes from team staff). So how about if you took a poll asking Wisconsin residents “would you support spending 4 cents out of every $100 in your state income taxes to keep the Buck from moving to Seattle” you would probably get a different result. Aqib: That’s the Cup of Coffee Principle, which states that anyone will approve of anything if stated in terms of how many cups of coffee it will cost each citizen. I’d disagree with you on the “income taxes from players and staff revenue that clearly would not exist if the team leaves,” though. If the Bucks were to leave, fan spending would mostly go elsewhere in the state, so you’d be collecting taxes from whatever else people were going to see. The only thing the state would really lose is whatever tax revenues flow from things like NBA TV revenue, which isn’t nothing, but it’s not likely to be $15m a year, either. Aqib: Another perspective: The debt is just one piece of the subsidies now granted. The state has paid $20 million for arena repairs in past 5 years. The city also chip in annually, and current arena debt on a donated building is still $20M. The city provides its usual services but does not get any property taxes. Unlike a tax-exempt college, Bucks take home huge revenue shares and pays no rent, leaving big holes in arena budget to be filled by taxpayers. I could live with two of following: free land, infrastructure, tax exemptions. But add it on to debt service and it becomes an albatross. Our state parks would be thrilled with that $15M (they’re now at $0 from state) State & local parks draw many tourists. Only other way to get funding for parks is from higher user fees. This arena can be built by the owners and other donors. Niel – Wisconsin’s personal income tax rate ranges from 4-7.85%. Lets assume NBA players have really good tax accountants on hand and their effective rate comes in at 6%. So on a $63 million payroll (thats the NBA salary cap and while times go over that lets call that the average and lets assume whatever taxes visiting players have to pay is equal to the taxes Bucks players are able to offset playing road games) so right there you have $3.8 million in taxes that wouldn’t be there if you didn’t have the team because those individuals wouldn’t be earning their money in Wisconsin. So the $15 million drops to $11.2 million, again in the context of a $36 billion annual budget. So while you and Andrew Zimbalist have made names for yourselves railing against sports subsidies in the grand scheme of government spending its not as big of a deal as you are making it out to be. Put another way, if you went through Wisconsin’s $36 billion is the $15 million or lets say it goes up to $25 million in the future with upkeep and what not, really going to be the most eggregious expenditure you find. Or is that the only money thats expended to either A) private businesses or B) people’s entertainment? Here in Cleveland we had a big debate on renewing the Sin Tax (Alcohol and Cigarettes) to pay for maintenance and continued debt service on our sports venues. The tax is 4.5 cents per pack of cigarettes. Many people ranted and raved that that was a regressive tax targetting the most economically marginalized people in the county. Yeah those same people are out campaigning to renew a 30 cents per pack tax to fund the arts. Somehow funding their hobbies are of vital importance but anyone elses is a moral abomination. You’re assuming that if the Bucks leave, that economic activity disappears. But a large part of those Bucks income taxes come from fan spending, and that fan spending would largely get redirected elsewhere. So you’d end up with more income taxes from, I dunno, Brewers ticket takers or restaurant chefs or something in exchange. It’s not 1:1, but it’s enough to take a big chunk out of it. PurseDefender – I completely get what you are saying. I’m just saying that the significance of the amount of money spent subsidizing sports venues is overblown. Sure your state parks have a significance that is being overlooked. I haven’t been to Wisconsin but I have heard nothing but bad things about your governor and his budget priorities. I’m sure if you and I sat down and poured through the state budget we could find things to get rid of that would allow both to be funded. Neil – I am not saying all the economic activity would cease. I am saying that the basketball staff would leave the state and therefore their income would no longer be taxed in the state. Even if people took the sports money and spent them all on entertainment options with in Wisconsin and all the people who would visit Wisconsin for a Bucks game (and whatever other events that arena would hold) all continue to visit Wisconsin for other events, it would still be doubtful that all the other entertainment providers in the state of Wisconsin would have to increase their staff to the point where $3.8 million in income taxes are generated. No, but it’s somewhere between $0 and $3.8 million. There’s a number where a “jock tax” would be revenue-neutral, but it’s almost certainly not $220 million. And that’s without even getting into the question of the slippery slope of kicking back to businesses tax revenues that they “generate.” As I’ve often pointed out, if I sent the IRS a friendly letter every April 15 pointing out that they wouldn’t have any income taxes from me if I moved to Canada, so therefore I shouldn’t pay any, I don’t think I’d get a very positive response. -The challenge of the “jock tax” argument is that arena proponents want to have it both ways. On one hand, arenas supposedly lead to high income earners being located in states or cities. But then on the other hand, the tax revenues generated by those individuals in these tax arrangements go directly to the arena and not to the broader public. Because arenas are not self-funding with income taxes generated by the arena itself, that means that cities end up spending multiple dollars to make one. -You cite the state, but in many cases the most difficult tax burdens are paid by cities and states in terms of redirected revenues. Long term debt on white elephant projects can be crippling to small, poor cities like Milwaukee–as they have been in Cincinnati and even Cleveland. The way this has played out the city will almost certainly pay the price again. -There is no legal basis for the idea that every person in a state is somehow obligated to pay for the upkeep of a professional sports team. Without getting all nihilistic and while avoiding the usual tiresome comparison to arts and educational funding–this sort of philosophy is corrupt and mercantilistic. The same issue exists with cable TV, where monopolistic arrangements essentially force the support of sports teams through cable fees to local sports networks. I’d be interested to see what the “tourism” gains are from Bucks games. Probably not very high, given the annual attendance. I am not saying the jock tax would be revenue neutral just saying its a net effect is a number more than $0 which partially defrays the some of the debt service on a sports venue, as does whatever income tax as a whole the teams pays. So at the end of the when you look at what is actual NET expenditure of a state city or county relative to their total budget, it isn’t the abomination your site makes it out to be. Now regarding your example of asking for your income tax back. Yes as an individual you wouldn’t be able to pull that off. However, if you had a business you often would get a deal just like that. Again I use Ohio as an example because thats where I live. I see companies do that all the time. In fact under the current governor all a company has to do is get another state to put an offer in writing and Ohio will match. They also give all kinds of breaks for “new or expanded” facilities, which in many cases is simply moving from one suburb to another. Michael Moore’s book “Downsize This” delves into tax breaks handed out to companies in relation to the amount of jobs that are moved into their jurisdiction. GDub – From what I read so far, the arena was going to be funded by the state. If it changes and its funded by the city then I will revisit. Now you’re right that there is no legal basis where everyone in the states has to pay for the upkeep of a professional sports team. However, the crux of my argument is that if you go through the budget of your city/state/county there are probably plenty of things people are paying taxes for that they have no need or use for. Just as they are people in the county I live in that are paying taxes for sports venues they never go to, I pay for the arts which I have no interest in. Now while supporters of the arts will argue about the intangible benefits of the arts I can argue about the intangible benefits of sports teams. At the end of the day they are both entertainment options that not everyone has interest in. While the Browns, Indians, and Cavaliers get subsidies from the City of Cleveland and Cuyahoga County, so do a lot of other businesses where its a net negative on the tax rolls. The City of Cleveland has an annual budget of over $1.3 billion. I am not 100% sure how much they are spending on the venues but my guess its around $20 million (the county also picks up a portion). Part of the $20 million the city gets back in parking fees from lots it owns (that are empty on non-event nights), income taxes from the teams and players, and from tourists (we tend to draw quite a few when we’re hosting teams from within driving distance) so the net outflow is a figure less that 1% of the city’s total budget. That’s a rounding error. And less than 1% of my city’s budget is $750 million. If that’s a rounding error, I’ll take one, please. So Neil have you gone through your city’s budget? I don’t know what city you live in and if it does or doesn’t have a sports team but if it does are your saying that the annual expenditures for said sports team is THE biggest item of questionable value? I have indeed gone through my city’s budget. And yes, there are probably bigger wastes of money than the numerous (six, if I’m counting right) sports facilities that it has spent money on, and I’ve railed against those as well. Just not on this site, because this site is about (wait for it) subsidies for sports stadiums. Again, you’re not acknowledging the circular nature of the income argument. If you take the “spend money to make money” approach (sports arenas bring in high incomes/income taxes to cities that wouldn’t be there otherwise) then you can’t argue that it is a good idea to spend those same high income tax revenues on the sports arena. The advertised benefit it lost. In most of the world, sports are watched in fairly simple arenas, and when cities own the arena, they get the financial benefits that come from gameday arena operations. When teams don’t like that arrangement, they build their own stadium. it can be done. Again, I’m not going to be nihilistic on expenditures. However, the economic benefit of shoveling money to multibillion dollar businesses because they say they need subsidies is highly dubious, especially for mediocre (or good) pro basketball teams. The business tax breaks you discuss are seen as some of the worst economic policy in America today. I’m all for having sports teams, and even giving them some reasonable subsidies. I just don’t buy all the hype. Just because there might be any value in having a sports team (tangible or intangible), taxpayers need not hand over scads of cash. It’s all about priorities, and we’ve let sports become a national religion. We’re willing to give these monopolies everything, and let them get away with scandalous behavior (skimming revenues earned by others) just because they’re viewed as gods. That’s where we get in trouble. We can try to get a little more rationale about it all, and quit acting like loves-struck adolescents. If we’re lucky we can get some politicians to stop making bad deals driven by desperation. GDub – You’re right that its circular to simultaneously say that arenas generate income taxes by bringing high earners into the state AND we should use the income taxes from said high earners to fund the arena. But thats not my argument. 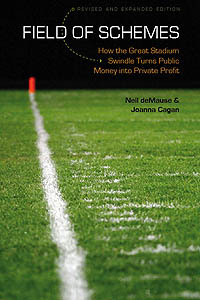 My argument is simply that when take the annual debt service and maintenence expenses for a sports venue, back out the personal income taxes from players, staff, and the corporate incomes taxes that the team would pay (all of which are easily indentifiable) and whatever taxes are spent by tourists who come in for events in the venues be they concerts or sporting events (which admittedly is harder to identify and varies from city to city), the net annual expenditure when viewed in terms of the overall budget of the state isn’t all that much. If you or I sat down and went through Wisconsin’s budget or Missouri or the City of Cleveland we would find worse uses of tax payer funds. We spend $15 million or so a year on the football stadium (before backing out the revenues it does generate) and people scream bloody murder but no one bats an eye at $20 million a year for the arts? At the end of the day both are entertainment options. Granted one is a bigger more profitable industry than the other, but the reason for that is one appeals to more people than the other. Sure one would have reasonable argument that taxpayers shouldn’t be subsidizing for-profit companies but again if you went through the budgets you would see a lot more corporate welfare going on for a lot bigger enterprises, but you don’t hear about any of them as much as you hear about sports subsidies. Aqib: I know you’ve given this a lot of thought, and so have many economists (who usually come to other conclusions). You make some interesting points, but existing subsidies of sports in MKE dwarf all support for arts & even parks, which are used by all. MKE Co. gives its world-famous art museum $1 million a year, and that’s to maintain 2 buildings and lots of land that the county owns. I’ve looked at all kinds of economic development deals and sat on a audit committee of a suburb I used to live in. There are Barons are getting a lot more than what is going to sports teams. In Ohio all you have to do as a corporation to get a tax break is get an offer from another state. So if you called up any other state and said “hey what would you give me if I moved to your state” you show that to the states econ development agency. You would get all kinds of breaks and incentives even if you were never seriously going to move. If you were a real estate developer if you build a housing development in the City of Cleveland they would give you a 15 year property tax abatement. Now everyone knows that one of two things would happen 1) people who buy homes in development would be paying more money because the developer will factor in that savings into the price or 2) existing homes would decline in value because people would rather buy homes where they get discounted property taxes for 15 years. So my point is (and my impression is we aren’t really all that far apart here) that so much is being given out to the well connected and powerful that when you add it all up dwarfs whats being given out for sports venues. At least with a sports venue I can get some casual enjoyment out of it. Sports deals are notable for a few reasons, however. First off, they’re usually among the most expensive: There are non-sports subsidy deals that get into the hundreds of millions of dollars (Boeing in Washington state comes to mind), but they’re rare compared to stadiums. And in public cost per job, too, sports subsidies tend to be among the highest, often coming it at $250,000 per job or higher. There are definitely other bad ways to spend your money than on sports subsidies. And, hey, maybe there’s a price point where Wisconsin residents would say, “Fine, if the government’s going to blow money on something stupid, $50 million (or whatever) to keep the Bucks isn’t the worst way to do it.” Unless you believe the MMAC poll, though, most people haven’t yet reached that point — and even if they had, it would still be worth complaining about a world where big corporations, sports-related and otherwise, see shaking down taxpayers for handouts as part of their standard business model.